Fifty years, 10 kilos, two National Championships, 1 new bike, a tuck/roll/slide, half a Grand Tour and a lot of punishing races; our resident A3 Dave Smith looks back on the year that was. Guess how many times I’ve had the chance to win a road race on my 50th birthday? Once. That’s how often. And did I do it? Did I bollox. But I wasn’t far off almost being able to get close to possibly winning had things gone very differently. 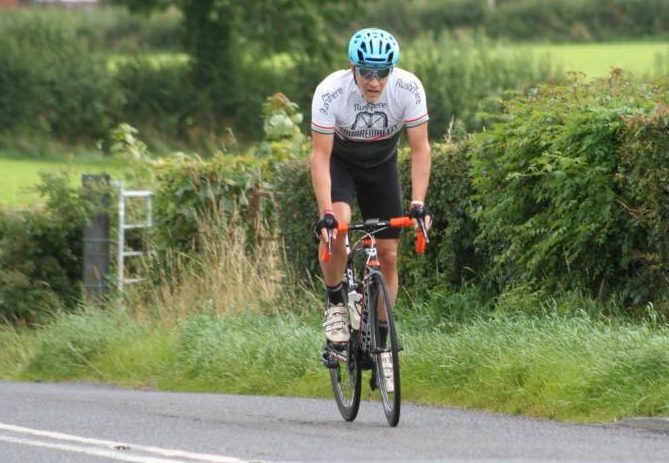 It was the John Mulligan Memorial, on one of my favourite circuits, and all went to plan until the last half mile when a bit of premature congratulation set in and I looked the wrong way and the sprint was gone. And the wheels I had been on were up there. The pressure of trying to deliver a birthday win was too much. But the day was still fantastic, as not only was I fifty not out, but top man Deccy O’Neill from my club won the A4 race and that was brilliant to see (even though I didn’t actually see it). He won by a fair distance in the finish line draggy sprint I was supposed to be good at. For more from young David, you can follow this link. If you’ve read my other wee stories, you know I’m not the lightest rider in the pro peloton, or even the A3s, or even the nearest trucker’s cafe. Well now I’m a complete biffer after a few weeks rest were followed by a broken wrist, a dose of bronchitis and a total of four hours riding in the last two months of the year. So here’s a tip for free; I will not be closing that gap until at least April and I suggest you just come round me first time up the drag at Annaclone. I’ll see you after the race, unless I can shift 10kg without surgery. The Masters 50 national road champs were great. I thoroughly enjoyed rolling around pretending I was good. I found the pace comfy, and knew John Madden was likely to bugger off up the road at some stage. So once that played out, I knew that 8th place would get me an A2 licence and so I got myself placed right as we hit the last wee lane before the finish. Then a bump over the last rise, an excursion into gravel and the chain dropped off, along with my soul. Into the last turn and I started a half-hearted sprint from the back of the bunch. Why is anyone’s guess? Balls. A few weeks later I decided to have a pop at the MTB Champs as that’s how I got into cycling in the first place. Now, far be it from me to be all negative going into a race, but a 350-mile week was not likely to be the best preparation for tearing around over the roots of all evil. Nor was 65 miles the day before likely to leave me fresh, though there was a very valid reason for this*. From past experience I knew I’d be flying or dying and dying I was; out the back 23 seconds after the start and feeling horrified that I was exposing spectators to such a feeble effort. *The reason for the high miles was my traditional ‘half Tour de France effort’, where I do half the distance of every stage. This Tour50Percentness is something I’ve done a couple of times now along with half the Vuelta and almost half the Giro. It’s a cracking way to get some big miles in, find new roads, force yourself to ride when you’re fecked, and screw up your chance at doing well in a mountain bike race. The weekly average was about 500km for three weeks, which is hard to beat. Normally I don’t try to race while I do the half Tour, but I had a cracking new bike that was built for more fasterness and I wasn’t going to let being wrecked stop me from racing. I’d gone from a great all-round ‘do everything’ bike to a Sensa Calabri, which was all aero and electronic – and fast. So that kind of guff has to be relished. You can’t get a bike like that and not race it. One of the races I headed for was the first running of the Oldcastle GP. It was on one of the best circuits I’ve raced; it had a bit of everything. The climbs were just long enough to sting us biffers without being tailed off, and the fast descents and finish were absolutely brilliant. In fact, I loved the circuit so much I left some skin behind after a touch of wheels in front of me. As I headed over the bars I tucked, landed on the back of my head and shoulders and slid. Apologies to the lad with the buggered elbows who I rode over, and the lad who I failed to ride over and instead hit. The bike was fine though. The shower stung a bit. After that I have no idea what races I did. Apart from the Ulster Masters 50 champs after three weeks of little sleep. Heading into the hills I found myself up the road wondering what I was doing up the road, before being not up the road, then down the road, then in the car on the way home. At this stage my interest in racing was akin to my interest in choking on my own vomit. I suspect averaging 14,000km a year for the last three years just ground down my brain and I had to walk away from the bike for a while. Apart from the racing the other highlights of the year were doing Mizen to Malin in three days and a 215-mile MTB ride with that Guy Martin off the telly. Until you’ve fallen asleep while riding and slept in a piss-filled bus shelter near Swatragh, Co Derry, you haven’t lived. New Year, old me; season bearing down on me and there is only one thing worse than heading into the season behind schedule and that is not heading into the season at all. So I’ll see you out there and let you A3s collect a few points while I work on my fitness.